1. The above picture isn’t a mockup of some lofty futuristic eco-architecture. It is now and it’s Chicago’s City Hall. If you’ve never explored Chicago’s Green Roofs project, you’re in for some surprises. For instance, did you know that nestled in that photo above are beehives that produce salable honey? If you’re curious about which city rooftops are green (or where to buy some of that honey) check out the city’s Green Roofs page or take your binoculars up to the Skydeck of Willis Tower and see for yourself. 2. A little more visible from our vantage point are the city’s Green Alleys projects. Chicago’s Department of Transportation began the green alleys pilot project in 2006 and renovated more than 100 alleys by 2010. What is a green alley? Check out the city’s comprehensive and well-illustrated Green Alley Handbook. Who knew your back alley could be a marvel of modern eco engineering. By the way, there’s a lot more to these alleys than just pretty landscaping. Take a look. 3. Being a relative newcomer to Chicago, I was very pleasantly surprised by the city’s incredibly progressive Sustainable Backyard Program. Residents can get cash rebates from the city for buying rain barrels, compost bins, native plants and trees from local retailers. A great way to help the environment while supporting local business and spending more time outdoors. Unless extended, the rebate program runs until 12/31/2012 so make this your year for creating a more sustainable backyard. Oh, and if you’re a retailer wanting to learn more about getting involved with the rebate program, consider attending the upcoming workshop on March 1st. 4. Finally, to learn more about any green & growing topic imaginable, check out the list of free and low-fee workshops offered by the Chicago Center for Green Technology. Learn about anything from how to install green countertops to finding out how the city uses vegetable oil from local restaurants to produce biofuel. Their building also contains a staffed resource center and free exhibits throughout the year. Wood decking over composite roof liner. EarthBoxes haven't arrived yet. In the past I’ve gardened ground-direct, in raised beds, or in standard planters. 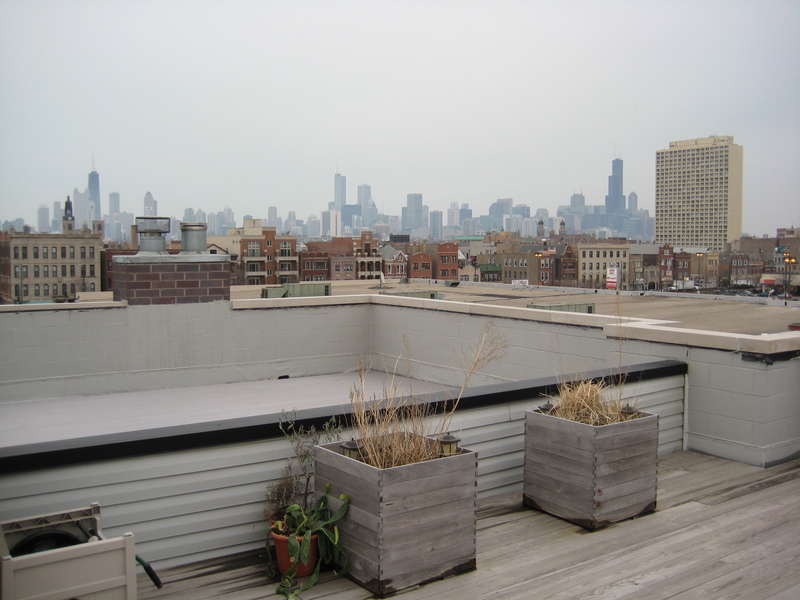 This year, because of the unique challenges of growing on a Chicago roof top, I chose self-irrigated planters (SIPs). Specifically, EarthBox brand. EarthBoxes are popular in Chicago for many practical reasons, but also because they have received a lot of attention from local celeb chef and roof top gardener Rick Bayless. 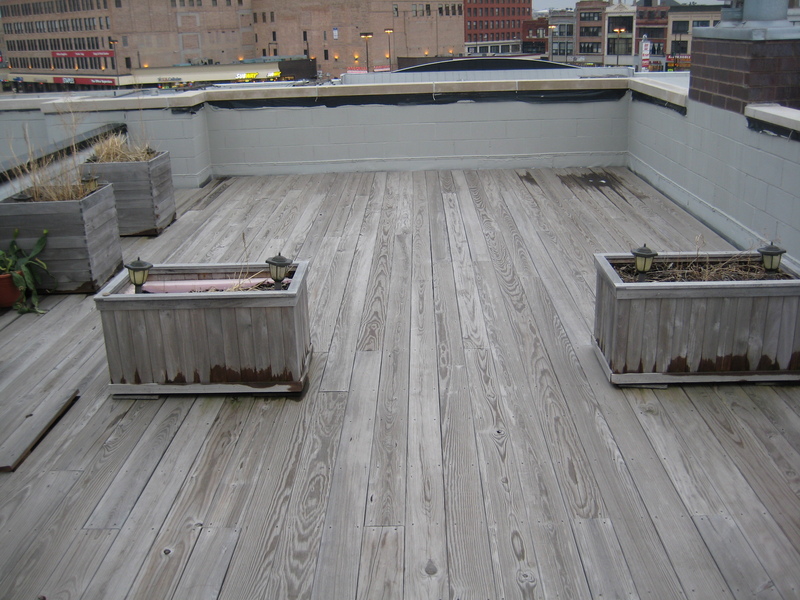 The Inside Urban Green blog posted an article several years ago about Rick’s rooftop. That last point can be argued but even after reading a lot of ingenious garden blogs, I still found EarthBoxes to be a solid choice. Even DIYers end up spending money on plastic buckets and fittings and tubing and trellises. And I’m not so sure the hardware buckets and tubing are made out of safe plastic. I’m all for DIY projects, so if nothing else they may save a few bucks and are a fun project. But I’m also all for supporting small businesses doing big things like EarthBox. I started out by purchasing 10 EarthBoxes so I got a bulk discount of $27/box. After pricing planters in local garden centers and other SIPs online, that’s still a pretty good price. Also, it’s pretty clear they are popular enough that I could easily resell them if I wanted to. The EarthBox website explains that each box holds approx. 2 cu. ft. of potting media. I spoke with a salesperson at Downtown Home & Garden Center in Ann Arbor, MI who highly endorses EarthBoxes and claims they only take 1.5 cu. feet. So that’s less than 80 pounds of wet weight per box. The Garden Center sold 2.0 cu. ft. bags of Sunrise organic potting mix in the media ratio that EarthBox suggests so that’s what I chose. I’ll be amending with dolomite and organic fertilizer. I also spoke with the guys at Green Thumb Garden Center in Ferndale, MI who suggest I supplement my plant feeding with silica. They believe it’s a natural way for plants to add their own extra structure to their stems for situations like rooftops in Chicago where wind is a huge factor. EarthBox sells a trellis system but that would have made my purchase substantially more expensive. For support I’ll do DIY trellis and wind breaks this year and try the silica. Clearly this year will be a big experiment, but I suppose with gardening every year is. Rooftop view looking East towards the city.